Praise for Caroline Kepnes and You Hypnotic and scary. Stephen King I am RIVETED, AGHAST, AROUSED, you name it. The rare instance when prose and plot are equally delicious. Lena Dunham From debut author Caroline Kepnes comes You, one of Suspense Magazine s Best Books of 2014, and a brilliant and terrifying novel for the social media age. When a beautiful, aspiring writer strides into the East Village bookstore where Joe Goldberg works, he does what anyone would do: he Googles the name on her credit card. There is only one Guinevere Beck in New York City. She has a public Facebook account and Tweets incessantly, telling Joe everything he needs to know: she is simply Beck to her friends, she went to Brown University, she lives on Bank Street, and she ll be at a bar in Brooklyn tonight the perfect place for a chance meeting. As Joe invisibly and obsessively takes control of Beck s life, he orchestrates a series of events to ensure Beck finds herself in his waiting arms. Moving from stalker to boyfriend, Joe transforms himself into Beck s perfect man, all while quietly removing the obstacles that stand in their way even if it means murder. A terrifying exploration of how vulnerable we all are to stalking and manipulation, debut author Caroline Kepnes delivers a razor-sharp novel for our hyper-connected digital age. 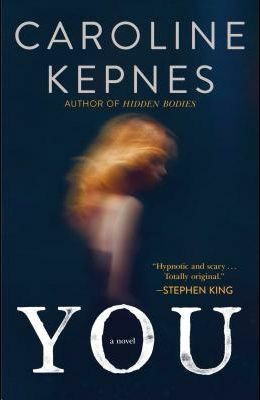 You is a compulsively readable page-turner that s being compared to Gone Girl, American Psycho, and Stephen King s Misery.